Royal Basin is a beautiful place to visit year around. Hiking to Upper Royal Basin while it is still snow-covered is a great way to beat the crowds. There are numerous mountains and peaks to be viewed in the upper basin. Sometimes so close its like living in a giant snow globe. The views in this basin keeps a hiker coming back for more each season. The walk is great training for a large backpacking trip on the Peninsula. There is significant risk of avalanche in a few areas along this route, but with proper skills and training one can access these risks in real time. The upper basin is no exception to this rule. I once watch rocks fall off Mount Deception the size of a household refrigerator. What was more chilling, the fact I was just standing in its path. Keep in mind this risk while traveling in this area early season. This trip is best done as a 3 day backpacking trip to truly enjoy the Olympic Mountains. Come along on a journey told with photography and video of our day hike into Upper Royal Basin. Royal Basin day hike - 18 miles round trip. Looking down into Royal Basin. VFF day hike in Upper Royal Basin. Olympic Marmot in Royal Basin. 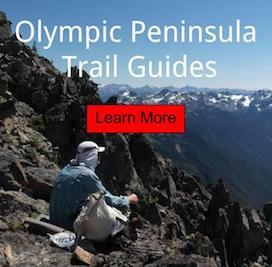 Be sure to read my 4 Best Olympic Mountain Hiking Guides.